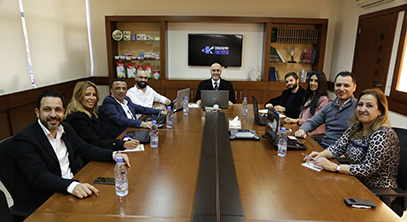 El Kallassi Trading Corporation is an FMCG company specialized in the distribution of premium & leading consumer products in the Lebanese market. With modest beginnings that date back to 1950 when the founder Fakher El Kallassi opened a cheese and dairy products store in Bourj Hammoud (Beirut), the firm rapidly grew. The expansion was driven by the commitment of Fakher El Kallassi and his sons to sell and market high quality goods with great nutritional value. This marked the start of great success and in 1977 “Fakher El Kallassi and Sons” became “El Kallassi Trading Establishment SARL”, and is currently known as "El Kallassi Trading Corporation". KTC is continuously focusing on expanding its portfolio through direct imports, exclusive franchises, new trademarks, brand names, and innovations that cater to the evolving needs and tastes of consumers. - The Dry division includes brands such as Dano, Biscolata, Ozmo, Maxbar, Butik, Geisha, Madam, Red Rose. - The Reefer division includes the brands, Kaval, Mr. Cook, Negroni, Voila, Jambino, Unium, Continental.